Phenotype MicroArrays (PMs) represent the third major technology, alongside DNA Microarrays and Proteomic Technologies, that is needed in the genomic era of research and drug development. 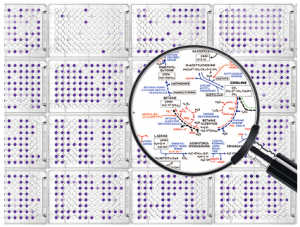 Just as DNA Microarrays and Proteomic Technologies have made it possible to assay the level of thousands of genes or proteins all at once, Phenotype MicroArrays make it possible to quantitatively measure thousands of cellular phenotypes all at once. 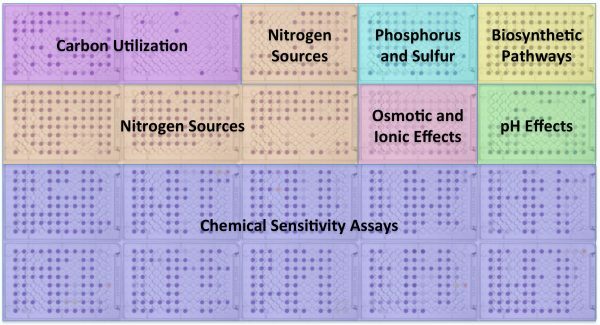 Phenotype MicroArrays are preconfigured 96 well plates containing different classes of chemical compounds designed to test for the presence or absence of specific cellular phenotypes. There are 10 panels designed to interrogate metabolic pathways along with ionic, osmotic and pH effects, and 10 panels to assess the sensitivity to various antimicrobials with different mechanisms of action. DNA Microarrays and Proteomic Technologies allow scientists to detect genes or proteins that are coregulated and whose patterns of change correlate with something important such as a disease state. However there is no assurance that these changes are really significant to the cell. Phenotype MicroArrays are a complementary technology providing the needed information at the cellular level. Phenotype MicroArrays are preconfigured sets of phenotypic tests deployed on microplate panels. Each well of the array is designed to test a different phenotype after inoculation with a standardized cell suspension, allowing simultaneous testing of thousands of phenotypes in a single experiment. Phenotype MicroArrays use Biolog’s patented redox technology, with cell respiration (NADH production) as a universal reporter. If the phenotype is strongly “positive” in a well, the cells respire actively, reducing a tetrazolium dye and forming a strong color. If it is weakly positive or negative, respiration is slowed or stopped, and the result is less color or no color. The redox assay provides for both amplification and precise quantitation of phenotypes. Incubation and recording of phenotypic data is performed automatically by the OmniLog instrument. To compare the phenotypes of two cell lines, one is recorded as a red tracing and one as a green tracing. 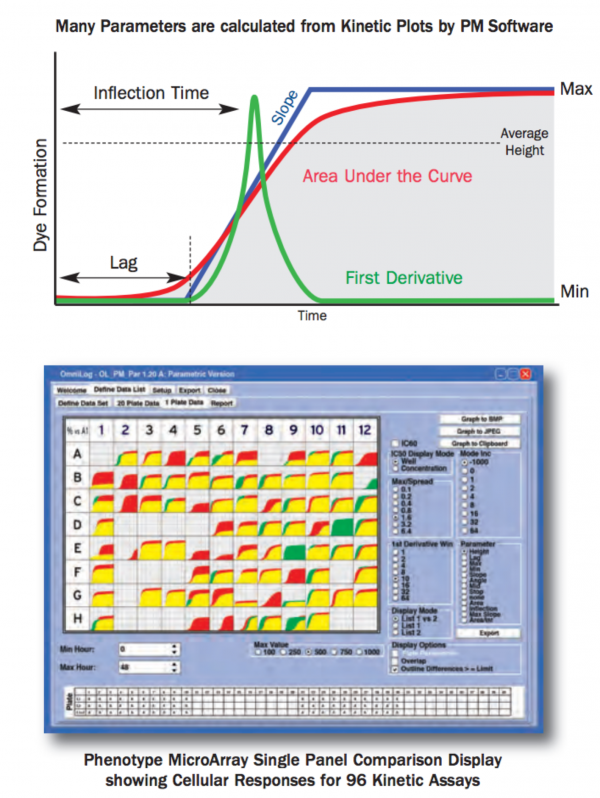 These graphs can then be overlaid by the bioinformatic software to detect differences. Areas of overlap are colored yellow, whereas differences are highlighted as patches of red or green. OmniLog PM software contains a suite of algorithms that work in conjunction with the OmniLog PM system and Phenotype MicroArray panels to automate incubation of up to fifty microplates at a fixed user-controlled temperature with complete collection of colorimetric assay data over time. These programs allow for display of kinetic data from PM panels recorded by the OmniLog PM system, manage and analyze the data, export it in a variety of raw and processed forms, and generate reports.